The adhesive used to attach the braces to your teeth cures rapidly, but takes several hours to cure completely. You can eat any time after leaving our office. However, we ask that you remember the list of foods that may be harmful to your braces. Until you become accustomed to eating with your new braces, you may find it beneficial to follow a diet that consists of all soft foods. Initially, the braces feel as if they stick out. This feeling is normal. As you become accustomed to your braces and tooth alignment improves, this sensation will cease to be a concern. 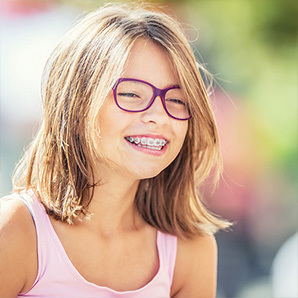 Although the brackets have been rounded and smoothed, until the cheek tissues have toughened, you may find it helpful to use a pea-sized or grape-sized piece of orthodontic wax on the irritating bracket or wire end, by embedding the irritating bracket or wire totally within the wax. If your supply of wax runs out, please call our office for more. The wax may also be purchased at a local pharmacy or grocery store. You will probably notice some discomfort beginning a few hours after your braces are placed. Some teeth, usually the ones in front, may be tender and sensitive to pressure. Occasionally, patients report they experience no discomfort, but most patients have some soreness a few hours after having braces put on. This soreness dissipates within a day or two. Exactly when the discomfort will cease is impossible to predict and differs with each patient. Ibuprofen (Advil® or Motrin®) in regular doses is recommended for discomfort. If Ibuprofen cannot be taken or is not effective, Naproxen (Aleve®) in regular doses is a good second choice. While Tylenol® will address discomfort, it is not an anti-inflammatory medication and thus it will not work as well to alleviate the inflammatory response to moving teeth. For maximum effectiveness, it may be best to take such medications before the discomfort begins. And please be aware that while local use of Ibuprofen is recommended, chronic use of any over-the-counter anti-inflammatory medication will slow down tooth movement and may increase treatment time. It is necessary to clean your braces, using the hygiene kit and instructions provided. Doing so will prevent scarring, cavities, and gum disease. Additionally, teeth move faster in a healthy environment. Please see the oral hygiene page for a review of cleaning instructions. Make sure you understand what you are to do until the next appointment. Your responsibilities could include wearing elastics as instructed, and/or following specific hygiene and diet instructions. Make sure you have an adequate supply of orthodontic wax, special cleaning aids, elastic rubberbands, or other related materials you might need between appointments. Whenever possible, schedule your next appointment before leaving our office. Waiting one to two weeks after an appointment before scheduling your next visit complicates the scheduling process, since appointments are typically programmed six to 12 weeks in advance. Postponing appointments is a common contributor to extended treatment length.